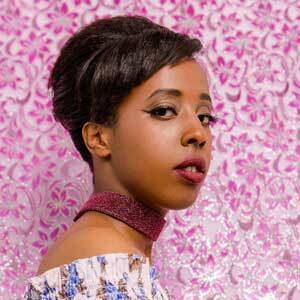 Ladan Hussein, known on stage as Cold Specks has returned with her most personal work yet. The artist recognized for her twistedly enthralling lyrics and distinctive soulful voice, has dug deep and returned to her roots. In this masterful body of work, Cold Specks intimately explores her identity as a Somali-Canadian woman. She’s unveiled and allowed herself to stretch her palette thematically. The rawness that’s deemed Cold Specks a dark soul, has revealed itself to be a cathartic after glow, illuminating the sort of light born through healing. Like waves thrashing in a chaotic sea in the middle of nowhere, Fool’s Paradise encapsulates the naturalness of existing during difficult times. We find Ladan rejoicing the survival of those she loves while mourning for the sorrow that continues to linger after it has beckoned its doom. Far gentler than her electrifying sophomore Neuroplasticity and her midnight debut I Predict A Graceful Expulsion, Cold Specks has honed her artistic agency and has invited you to bear witness. During the creation of Fool’s Paradise, Ladan became obsessed with pre-war Mogadishu, her family’s home city and Somalia’s capital while living in Toronto. “I just fell in love with the idea of a city I’d never known, this beautiful city by the beach, I tried to imagine what it looked like before the war,” she remembers. Sonically, Cold Specks has not lost her warm melancholy, in “Rupture” and “Ancient Habits” textured wiry synthesizers drape her vocals alongside her weightful sentiments. “Rupture” is the catalyst of the record’s woeful themes and sounds. Last year, a dear family friend was shot steps from his home in Toronto. “I remember while we waited half an hour for an ambulance to arrive.” Her lyrics are potent and mournful: “Fall back into place / Blood of no-one / Made of gold / Worry, worry me,” Cold Specks sings emotively. Lyrically, Cold Specks sounds like her old self in “Solid,” hazily looking for a way to identify a familiar ambiguity she yearns to understand. It was the first song written for the album, she recalls. “I felt as though we had caught a sound we’d been hunting for quite some time.” she says. “New Moon” is a personal love letter to oneself about love and growth, Ladan says. “Witness” is about feeling hopeless as the world collapses around us and we continue to hold on. The dreary sulkiness carries on into “Void” a song drenched with water imagery and bashful resilience about piracy by Somalia’s coastline. “Exile” reflects Cold Specks’ process in creating this entire record, an ode to where she’s from and how far she’s grown. As the story goes, Ladan left Toronto and took a one-way flight to London in pursuit of her music career after dropping out of university. “I was going to University of Toronto. I was studying political science and English, I wanted to get into law school afterwards. My parents were incredibly proud.” Ladan reflects. Those were dark times, she recalls. She had lost a family friend to gun violence two years prior her debut and was undergoing what she calls a quarter-life crisis, grappling with depression, while discovering who she was. Ladan kept her musical career a secret as to not disappoint her family’s expectations. “[I Predict a Graceful Expulsion] was a record about loss but the depression carried on after that tour. I had to consistently perform these very personal songs to strangers while still dealing with it all and so I detached and removed myself from it. I wanted to be erased,” Ladan says. In 2012, she used the moniker Al Spx in interviews and shows. Cold Specks was a mystery woman. “Eventually, I learned to dance divinely between two worlds. I really discovered and learned to fall in love with myself and my identity,” and it is apparent in Fool’s Paradise, which feels like a carefully crafted purification. Eventually, in 2015, Cold Specks would drop the Al Spx moniker and embrace her name. Both her albums were nominated for the Polaris Music Prize with the former also earning a JUNO Award nomination for Breakthrough Artist Of The Year. Ladan’s career quickly took off in the span of five years, dismantling her mystery and leaving fans and critics curious. She’d collaborate with renowned artists, contributing to the works of Massive Attack and Blue Note’s Ambrose Akinmusire. In 2013, she was invited to sing at Joni Mitchell’s 70th birthday party. After moving back to Toronto from Montreal, Ladan lived with her parents for sometime in the suburb of Etobicoke. During this time, her father would play her Somali music and they’d examine “the intricacies of the beautifully woven words,” says Ladan. “The music is deeply poetic and almost always centred around these stunning voices, so it was important for me to fully grasp it even if I was twisting my mother's tongue,” she adds. Fool’s Paradise is what finding home sounds like, and Cold Specks has sailed her way to shore after grueling trial, error, and musical acclaim. On Fool’s Paradise, Cold Specks is fully realized. She exists as an artist gutting life by its balls, she is both darkness and light.